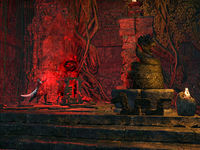 The Teeth of Sithis, a pair of ancient xanmeer temples, has been overtaken by the servants of its heretical, former high priestess, Shuxaltsei. She has taken the custodians of the Teeth captive and is sacrificing them in some profane blood rite. Talk to Nisswo Xode just outside the Teeth of Sithis. Search for any survivors inside the temple. Regroup with Xode atop the western xanmeer. Disrupt sacrificial altars and kill Shuxaltsei. Talk to Xode outside the delve. As you walk by the Teeth of Sithis delve, you'll come across Nisswo Xode, who warns you to stay back. Once you enter the xanmeer proper, be prepared to deal with various Sun-Eater vampires, carnivorous plants and traps. The trapped floor tiles will be highlighted when you crouch and go into stealth. Navigate the western xanmeer to find the first captive, Nisswo Dakee-Kai. "You come to drain the sap from me again, but I have little left to offer your master. When the last of us are bled dry, it will be you who quenches her endless thirst." I'm here to rescue you. Xode sent me. "It does not matter. We are too entangled in the rotting roots of our past to flee from it. They have spread far and wide, unnoticed beneath the surface, and now that they have broken into the light it is too late. So, what would you have me do?" Meet Xode on top of the western xanmeer. We'll decide our next move from there. Continue on and find the next captive, Nisswo Nedhellas, who can be found on the upper platform within the chamber. "Can't get enough of this fine vintage, eh? Well, you're cut off! Come any closer and I'll bash your fangs in!" Easy. I'm here to rescue you. Xode sent me. "He got out? Slippery skink, that one. Well, what are you waiting for? Set me loose, so I can give these bloodsuckers a good thunk right in their pointy teeth!" You're in no condition to pick a fight. Find Xode, he should be at the top of the western xanmeer. Meet up with the survivors. 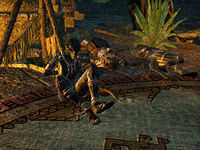 As these are the only living captives you can find, head to the top of the western Xanmeer to meet up with the survivors. Talk to Nisswo Xode. Cross the bridge and enter the eastern xanmeer, there will be two sacrificial altars which will need to be destroyed but they will be in the same chamber. Once the ritual altars are destroyed, it's time to put an end to Shuxaltsei herself. Descend into the caverns below the eastern xanmeer and fight your way to the high priestess, as you approach the ground will shake as she continues her ritual. You will find her summoning a Hemonculous and chanting to Sithis. In combat she displays a mix of Fear Mage abilities as well as a host of blood-related spells unique to her. Once she is dead, you can leave the xanmeer through a door to the south of Shuxaltsei's chamber. Once outside, you will on one of the step levels of the xanmeer and you can jump down to meet up with the Nisswos who will be discussing what they should do next. Nisswo Xode: "Come, the Teeth of Sithis won't be safe until we get aid from the tribes." Xode, one of the escaped captives, has begged me to enter the Teeth of Sithis and rescue any surviving captives I find. I found and freed a couple of survivors, but they are the only survivors I found. I should meet Xode at the top of the western xanmeer as planned. Xode believes Shuxaltsei's blood rite will hold terrible consequences for the world if it is completed. He asked me to destroy her sacrificial altars before confronting her myself. With the sacrificial altars destroyed, Shuxaltsei's ritual has been foiled, but the high priestess still poses a terrible threat. Xode asked me to put an end to her tyranny, once and for all. Finishes quest I destroyed Shuxaltsei, putting an end to the blood sacrifices for good. Xode will want to know that the worst of the threat is beyond him.